Manufacturer & Exporter of Core Drilling Machine for Construction Industry. Our product range also comprises of Soil Testing Equipment, Asphalt Testing Equipment and Rock Testing Equipment. Designed to reveal the cupping qualities of metal sheets and strips. Can also be used for testing adhesion, elasticity and priority of coat of paints or varnish by way of comparison. The material after fracture gives its grain structure and constitution. The results produced are highly reliable and accurate. This simple to operate Lacquer and Paint Testing Machine is used for rapid and accurate measurement of the elongation and adhesion properties of protective paints and other coatings of all types using the ERICHSEN CUPPING TEST in accordance with DIN ISO 1520 ISO 1520 BS 3900 : Part E4 NF T 30-019 SIS 18 41 77 on sheet metal specimens up to 1.5 mm thick and from max. 100 mm wide.The ERICHSEN Cupping Test provides valuable information on the suitability of a coating material forapplication in practise. Low cupping test values mean that the coated product may not withstandelongation stresses arising, resulting in corrosion of the substrate. 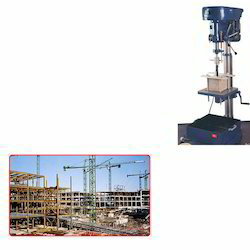 We offer a wide range of Core Drilling Machine for Construction Industry. The Core Drilling Machines we offer is recommended amongst the clients for its durability and reliability.